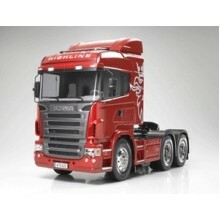 This is a special edition of Item 56325 MAN TGX 26.540 6x4 XLX. The cab, F, H, K, M and CC parts of the kit have been moulded in Gray and pre-painted in Gun Metal (Tamiya Colour TS-38) for a cool look, with a durable coating applied to protect the paintwork from damage. 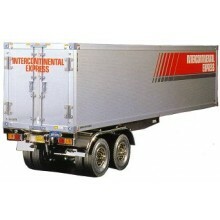 Special feature 1 Length: 458mm, Width: 193mm, Height: 298mm, Wheelbase: 272mm. 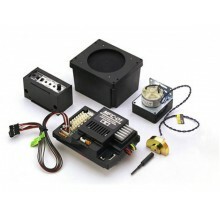 Special feature 2 Cab, F, H, K, M and CC parts are replaced with pre-painted Gun Metal color parts. 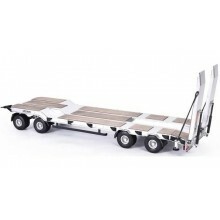 Special feature 3 The model features a realistic body and a 3-axle chassis with durable ladder frame. Special feature 4 When controlled with a separately available R/C system, the 3-speed transmission enables authentic gear changes while driving. 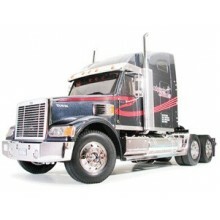 Special feature 5 Metal leaf springs and friction dampers enable realistic suspension movement. 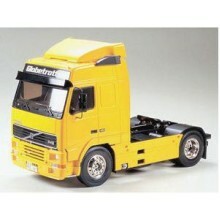 Special feature 6 Cabin tilts forward just like the actual truck. Special feature 7 The included coupler enables connection with any currently available Tamiya 1/14 scale trailer. Special feature 8 The realistic interior includes seats and dashboard while metal-plated parts as well as metal transfer emblems enhance exterior detail.